India and Pakistan will work together to fight terrorism, the countries' prime ministers have announced. Meeting in Egypt, they said the fight against their "main threat" should not be linked to wider peace talks. However, India's Manmohan Singh later said no dialogue would start until those behind last year's attacks in Mumbai (Bombay) were "brought to book". Pakistan has admitted they were partly planned on its soil - and vowed to do all it can to bring the suspects to justice. Crucially, they also agreed to separate their debate about action on terrorism from more general dialogue. That was a key demand from Pakistan - and may make it possible for the mechanism of talks to be revived, independent of India's continuing demands for tougher action on militant groups like Lashkar-e-Taiba, the group India blames for the Mumbai attacks. The talks on Thursday - on the sidelines of the Non-Aligned Movement's summit in Egypt - were the third high-level meeting between the two nuclear-armed neighbours since the Mumbai attacks last November which brought an abrupt halt to peace talks. "Both leaders affirmed their resolve to fight terrorism and co-operate with each other to this end," the joint statement of the talks said. "Prime Minister Singh reiterated the need to bring the perpetrators of the Mumbai attacks to justice and Prime Minister Gilani assured that Pakistan will do everything in its power in this regard." "Pakistan has provided an updated status dossier on the investigations of the Mumbai attacks," their statement said. The two leaders also agreed to "share real-time, credible and actionable information on any future terrorist threat". 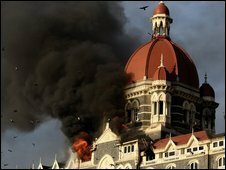 Last week Pakistan said the trial of five men suspected of involvement in the attack on Mumbai's Taj Hotel was likely to start this week. In a move likely to please Islamabad, the prime minister's joint statement said action on terrorism "should not be linked to the composite dialogue process" - which includes talks on the disputed territory of Kashmir. The BBC's Sanjoy Majumder in Delhi says many in India will see this as a major climb-down in Delhi's stance. He told a news conference dialogue "cannot begin unless and until terrorist heads which shook Mumbai are properly accounted for, (the) perpetrators of these heinous crimes are brought to book".